Stir pluots, honey, vinegar, lemon juice, lemon zest, and rosemary in a pot. Bring to a boil over medium high heat and then simmer for 20 minutes until thick. Remove from heat and add salt and pepper. Let cool and add chopped fresh chives. Use for crostini (see below) or as an accompaniment to grilled meat or chicken. Brush the baguette slices with olive oil and grill until toasted. 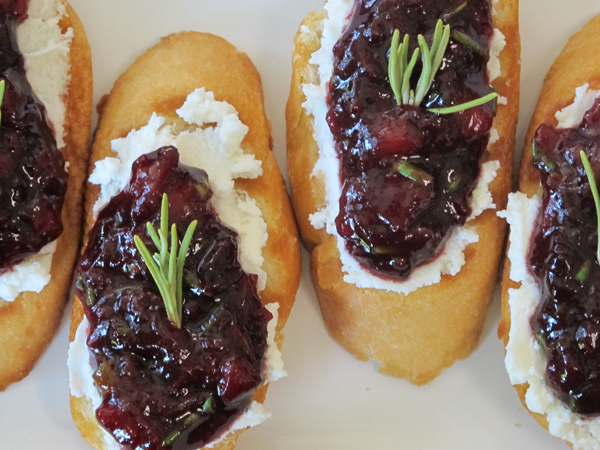 Spread with goat cheese, then with pluot jam.